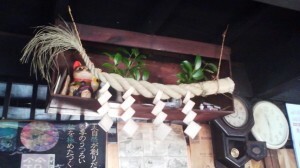 TsukuBlog | Ancient Rituals For Silkworms at Kokage-San Jinja- hanging on to life by a fine silk thread- on March 28th and October 23rd! Ceremonies are held at Kokage-San Jinja Shrine in Kangori Tsukuba twice a year- on March 28th and October 23rd – starting time around 3 pm. This past spring, on March 28th, I braved thunder and lightning to negotiate the steps up to the Kokage-San Shrine and join the priests and 3 older, local gentlemen to give offerings for abundant rice crops and silk production and to think back nostalgically upon the heyday of Japan’s fling with the worms and their precious cocoons. Kokage-San Shrine is yet another Tsukuba superlative. 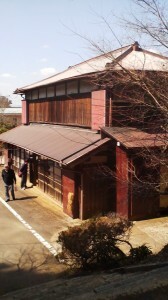 It is the oldest shrine in Japan dedicated exclusively to sericulture and once attracted thousands of worshipers, many from the textile towns of Nagano, Gunma and Yamanashi. 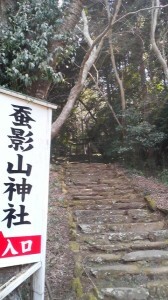 Located in the beautifully rustic Kangori (神郡) district of Tsukuba, the shrine is reached by ascending ancient and uneven stone steps through an even more ancient sacred grove. The sea used to actually reach　not very far from this site, and according to local legend (there are several versions ! ), in 6th century India there a princess who was constantly being abused by her step-mother. The situation got worse and worse and finally, the king decided that it would be best for his daughter to make her way to another land for a new start. He had her put in a boat made of mulberry wood and had her cast off. She made landfall near Mt Tsukuba. A local man called KONDAYU and his wife tried to help the princess- but to no avail. Starved and exhausted, she shrivelled up into a little worm, The couple put it in a big box and fed it mulberry leaves. It grew bigger and stronger. It made a coccoon. 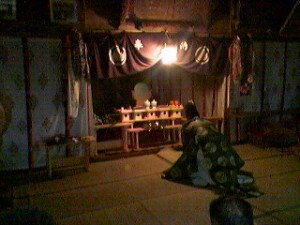 The deity of Mt.Tsukuba, in the form of a hermit named EIDO SENNIN (影道仙人), taught the local people how to extract silk thread from the cocoon. An old E-MA ( votive picture) depicting the story of the Indian Princess KONJIKI HIME- who turned into a silkworm after she died. 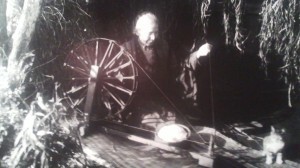 As a consequence, the local people learned how to produce silk! We reached the bottom of the stairway huffing and puffing. We then entered the dilapidated old shop which once served the throngs of pilgrims who would flock here. They still sold a special souvenir — Kokage Yo-kan (beanpaste). 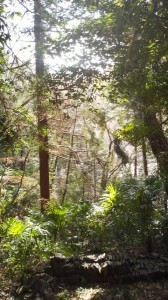 As a breeze entered the shop it gently lifted the paper displaying the price of the yokan. I noticed that for that day they had raised the price by 100 yen, taking advantage of the ceremony. Unfortunately, only 3 locals and I had shown up. Times change, things change, and this ancient rite is certainly hanging on by a VERY thin thread. 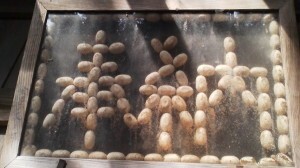 There are two other shrines I know about in this prefecture that are related specifically to sericulture. 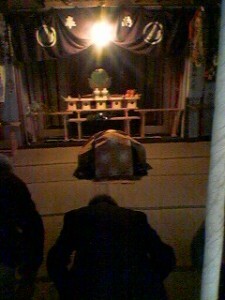 One is in KAMISU (神栖) and is called the SANREI JINJA (蚕霊神社) – the Spirit of the Silkworms` Shrine. 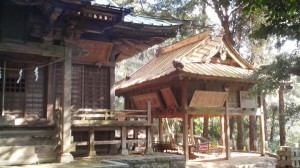 The other is in Hitachi and is called the KOKAI JINJA (蚕養神社). They are also associated with legends similar to the story of the Konjiki Hime. 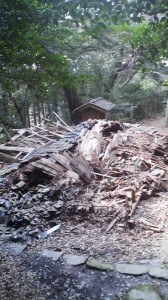 On a walk up to the shrine I found that one of the shrine`s old neglected structures had collapsed! * It was the invention of nylon which spelled the end of Japan`s silk industry. In fact, Americans joked that the word NYLON was an acronym standing for Now You Lose, Old Japan. The original meanings of the names of two of this region`s most important rivers- the KOKAIGAWA and the KINUGAWA also reflect the great importance of sericulture in this area in past ages. 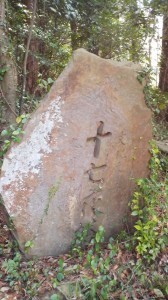 Though now KOKAIGAWA is written with the characters: 小貝川, mening Little Shell River, it is believed that the original meaning was Silkworm Raising River – 蚕飼い川- with the same pronounciation. The KINUGAWA is now written 鬼怒川,　which means the Angry Ogre River- but was probably originally the KINU (絹) GAWA: Silk River. Read more about the tradition of weaving fabric from linen and silk in this part of Japan from one of my previous posts. 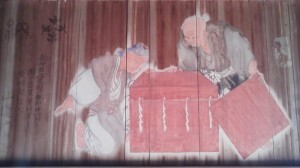 Another interesting article about old Japan. It’s a shame that many of these ancient structures, festivals and traditions are being lost or forgotten. Thank you Avi for documenting them.